Huron Pet Supply has all you need for your cats and dogs. Food, supplies, health care, toys, beds, carriers, crates, and so much more! Every month our pal Gizmo is sniffing out great deals for our club members. As soon as we know what he has found each month, club members will receive an e-mail with the details and the effective dates for the sale, or a link to a dollars-off coupon offer. Watch for this information in your e-mail box. Gizmo is always looking for special events to host at Huron Pet Supply. As a club member, you will receive notices and reminders of upcoming events like special pet picture days or pet adoption days. Watch your e-mail box for these notices during the month. Sometimes pet food manufacturers have important information about their foods that you should know. If a popular brand of food announces a formula change, or issues a recall, Gizmo will send you an e-mail to let you know. Several of the high quality brands of pet food sold at Huron Pet Supply offer a frequent food buyer rewards program. As a club member, we’ll manage your food frequent buyer information for you and let you know when you when you’ve earned your free bag. Not all brands offer the free food reward, so ask for details when you visit Huron Pet Supply. Huron Pet Supply, Inc., wishes to respect the privacy of our customers. We will not sell, share, or make available, your personal information which was collected during the Gizmo’s Pet Club registration process, or which may be requested in the future, to any third parties. We will use your information only to administer the Gizmo’s Pet Club program and to design benefits and offers to better serve you. Gizmo’s Pet Club is designed to communicate with its members via e-mail only. 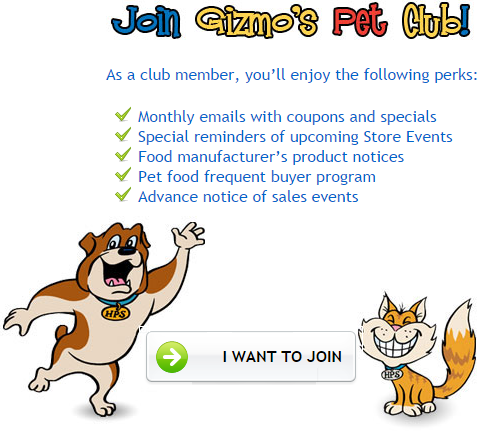 A valid e-mail address is required to participate in Gizmo’s Pet Club and receive offers, news and benefits. By submitting the sign-up form, you are being added to Gizmo's Pet Club mailing list, and are granting: Huron Pet Supply, Inc., 5060 Jackson Rd., Ann Arbor, Michigan, 48103, United States, http://huronpetsupply.com permission to email you. You may unsubscribe via the secure un-subscribe link found at the bottom of every email. Emails are serviced by Constant Contact. Huron Pet Supply, Inc. reserves the right to modify the details of the Gizmo’s Pet Club program, or to terminate.